Home Force Series What does it mean to be a Jedi? What does it mean to be a Jedi? I’ve given many responses over the years, but none of those actually answer the question. People don’t ask ‘What is Jedi Realism?’, they want to know what it means to be a Jedi. What does it look and feel like to be a Jedi? When I began training back in 2005, I was a pretty normal teenager. I was stressed out, plugged-in, and trying to learn who I was, and who I wanted to be. Most of the time I had no idea what I was feeling or why and I had problems I had no idea how to solve. I had a deep-seated feeling that I was missing something obvious, something right in front of my nose that would make everything come in to focus. But there was no such thing, no easy and obvious solution. Being a Jedi is not a magical fix all for your problems, it is not some spiritual placebo pill. It is a lot of hard work. But as I talked with people, read everything I could get my hands on, and learned to debate calmly and to meditate, I started to change myself. Incrementally I began to understand the tiny actions and emotions that made up who I was, and how they interacted. From there I began to learn control, to act instead of react, to allow for ambiguity and discomfort, and to embrace sadness and hard times as learning experiences, as data that would eventually lead me in the right direction. I learned to see the world more clearly and compassionately, and to keep that vision of the good in the world, of what the world could be tucked inside my mind. I learned to focus on my goals every day, not just dream about them, or make resolutions. Being a Jedi means being your best self, and then pushing a little further. It means opening your mind to new people and ideas, and fundamentally respecting those around you as living beings. It means never settling for ignorance when there is more to learn. It means letting your worries and fears and the turbulence of emotion fall aside to look at the world with objectivity and hope. Being a Jedi means feeling deeply connected within yourself, and to the world around you. Being a Jedi is not about reaching some mystical level of nirvana, but being a better version of who you were yesterday, and the day before. 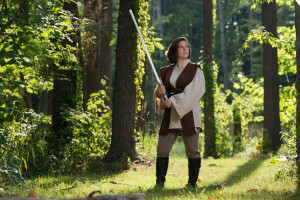 If you make that commitment to yourself, if you push forward every day with kindness and self-awareness, and the word Jedi resonates with you, that is what it feels like to be a Jedi. So, you tell me: what does it mean to be a Jedi? Nice website and I like what you are practicing, but just a few insights. Being a Jedi is easy, it is living like one that is the hard part. The question, are you a Jedi? is a false question. Everyone is Jedi, just some live more like it is so than others. It is like following the Buddha; you have to be able to see Buddha in everyone you meet before you can be a master. That’s an interesting viewpoint Jim; I think that everyone has the ability to be a Jedi, but being a Jedi is defined by actions, not by some internal trait.